This photo was taken in Honduras. 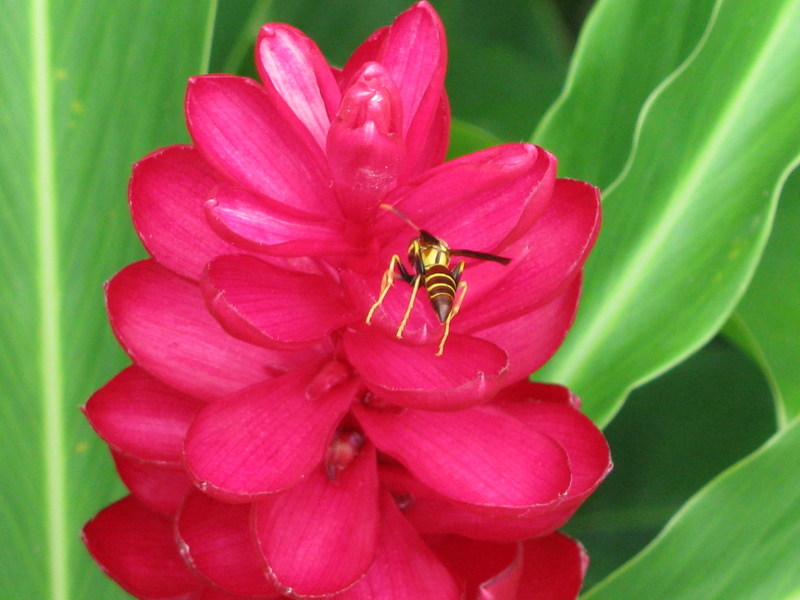 I was a bit hesitant about getting too close, but I loved the colors of the wasp and flower. This entry was posted in Central America, Travel, Travel Photos and tagged Honduras, Nature, Photography, Photos, Travel, Travel Blog, Travel Journal, Travel Photos, Wasps. Bookmark the permalink. Fortunately my camera has zoom, but I still have to lean in a little. It all worked out though! Wow, spectacular macro shot TBM!! The colours are so vibrant! Thanks! Honduras is a paradise and I loved taking photos there. I don’t like them either. Photo is beautiful with vivid color. Thanks for sharing. Thanks! I loved the colors. Beautiful! Very detailed and the colours are lovely! 🙂 I miss summer, can’t wait for it to come! The past couple of days have been great…it is really making me wish summer was here. great shot! I too would not venture close! I am not found of bee’s and wasps! Me neither! And I’m allergic to them. But I couldn’t help myself. Gorgeous photo! I am going to Guatemala for the first time in one week! I saw that you have been there before. I will be studying Spanish and volunteering in xela and then will spend a few days in Antigua where I am going tower a fellow wordpress blogger in person ! Can’t wait! Ps what is the “photo of the day” program? How do you do it and sign up? Thinking of doing it myself on one of my blogs. Good luck with your Spanish! If I think of more I’ll let you know. Great photo! -props for drawing in closer to to the little stinger. Thanks Nia! She was busy! They made a good combo! Me too, but at the time I was quite nervous. The Circle of Life in action. I loved it! You captured a nice clear photo! Looks great. Love the close up shots you take. What amazing colours – lovely shot!